I am excited to offer a special giveaway today from the creators of Feeleez: Toys for Emotional Intelligence. I’ve been clicking on Natalie’s blog for over a year now, gleaning from her nuggets of parenting wisdom. She writes about parenting with empathy and moving off the roller coaster of punishment and praise, which multiple studies have shown undermine children’s self motivation. Natalie speaks the same language as Alfie Kohn, who wrote Unconditional Parenting (a parenting game-changer for me), but in a softer, feminine, more “I hear you sister,” way. I have gotten to know Natalie best through her phone consults, in which she’s helped me numerous times (including, but not limited to The Funky Sock Disasters and The Sibling Battlefield). What I love best about Natalie’s coaching is that she sees more clearly into my kids’ behavior and my responses than I am able to. She then suggests a pathway which illuminates my own blind spots and leads me to the sanest most effective and compassionate trail through the trees of parenting. And the biggest endorsement of Natalie and Nathan’s work is this: Dan and I will be taking this course. * Incidentally, the latest New Yorker contains a lovely article on coaching, written by the surgeon/author Atul Gawande. Gawande explores the benefits of employing a professional coach. The results (for teachers, doctors, musicians, singers, athletes) are impressive. Why not parenting? ooh! a giveaway. And even better a most wonderful prize. We love Feeleez – they’ve really helped many conversations with our son about verbalizing his feelings. Last night he said “i’m mad!” and he made a posture/ face of one of the Feelez characters… and then we talked about his feelings of being mad. On the parenting front I always feel like I want to learn more.. that my husband and I have alot of similar parenting values but we’re looking for more ways to connect in our parenting. Thank you for your writing and your blog. hi again. I reposted the link to the giveaway via twitter. thank you! wow! this sounds fantastic, rachel!! john and i were just talking the other day about how much smoother things are running (like WAAAAY smoother) in our family now that he and i are making an effort to stay on the same team. always more to learn though as these kiddos keep growing and the rules keep changing. would love to check out this ecourse. This sounds wonderful. Last week with my little ones, I had more than one moment of feeling like I was totally failing at parenting. It’s great to have some new inspiration. Also, thanks for the Unconditional Parenting book rec. Coaching is the greatest find since salty found sweet. So glad to be introduced! Thank you! I would love to take part in this. Thank you. that would be so great…i’ll have to check out her blog! What a great thing to do! We can all use a little (or a lot) of coaching when it comes to our kids. I know I can be blinded by routine and not always see clearly into what they are asking for. I (we) would love to take a course like this! Thanks for sharing it with whoever gets to take it with you! totally awesome giveaway. always great to have some support in our lives… coaching is rad. 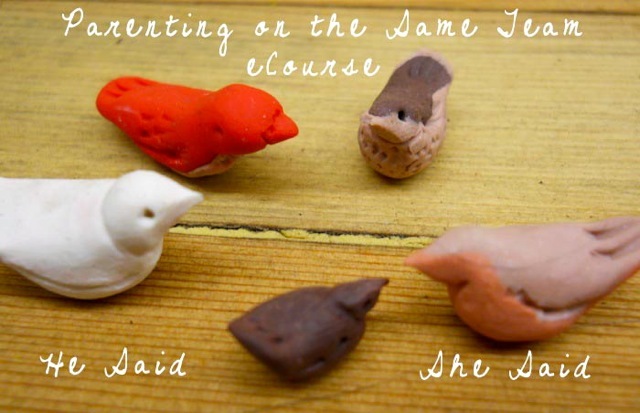 i wonder how much it would “work” to participate as a person trying to parent on the same team with a person who is no longer my partner… and who would never take an ecourse if his life depended on it… i know though that i always get a lot out of parenting discussions/sessions whether i fit the profile (couple) or not. Unconditional Parenting was life changing for me. I still struggle to leave behind the “power over” techniques of punishment and praise to get my children to comply with my desires. It is getting much easier now that the children often sleep through the night, and I would love to take this class. I would love for my partner to examine and hopefully adopt this approach. Im hoping to win the free course. Thanks for spreading the message! i just shared this on Facebook. I’m going to search now for my copy of Punished By Rewards by Alfie Cohn. My daughter caught me on the pottie this morning and said she has a tummy ache. she then said, “do you know why?” “It’s because of the way you yelled at me.” How smart she is to know her body is taking in the craziness around her. I would so love to be a more tuned-in parent. This sounds wonderful. I read Alfie Kohn when my son was an infant. He is now reaching 4 years old and I think having a refresher of those type of parenting ideas would be perfect. Thanks for the chance at this giveaway. I’ve been reading Natalie’s blog for a while now. I love her approach to parenting – could really learn a lot from the e-course. Toohnduwc! That’s a really cool way of putting it! may the lucky duck win! this sounds wonderful….i think i’ve figured out one small thing and they hurl me another! always learning and growing with kids! Giveaway for e course Parenting on the same team. If you’ve never read Natalie’s blog, she shares a wealth of information on empathy and using it with your children and yourself. Check it out! OK, my third post, I forgot to scroll up and hit share and instead made another comment here. Went to fb and shared there. Thanks!! Wonderful Rachel!! Thanks so much for the opportunity! Lately we’ve been slack about our communication. Why is it that when more stress appears, each of us want to crawl into our separate caves! I think we could use this right now, so much change coming! Beautiful! what a gift this would be! Hello everyone out there in the big wide world. I am lucky enough to get to parent in the same town with Natalie and Nathan and say hello in person. I would be really excited to take this course and see them in working action. It will be a real treat! Love Natalie’s feeleez blog and would like to take the course.. Interested how the he said/she said thing works.. Hahaha.. Living it right now with my partner, too, and our wild brood of three. Cheers! This stuff is great…I could use all the help I can get! We would love to win a spot on this class~ We’ll keep our fingers crossed! I would love to go through a course like that! I shared your blog on facebook as well. Thanks! i’m interested in this…..always up for beautiful sage advice to help megrow into a better parent, alongside and with the man. we just started to going to get therapy help again for parenting issues specifically. that’s a big big help too. so maybe i’m not the right one to win this, since i’m feeling resourced at the moment. but if i do win, i’ll trust! love. love. love people who help us to be better for our amazing kids. This sounds really interesting- thanks for organizing the giveaway! lovely giveaway, we love Feeleez in our home and as a parent i struggle to implement Alfie Kohn’s challenging but oh-so-intuitive perspectives. an added treat in this would be to have an excuse to spend some more time with my husband. with 2 kids under 3 our lives are so full we forget to talk sometimes! I would love to win a spot to participate in this e-course. My partner and I have an almost 6-month old son and spend a good bit of time talking about being on the same page and reading about attachment parenting, simplicity parenting and Waldorf approaches…Thanks for the giveaway! i’ve poked around natalie’s blog too – gems! What a wonderful gift to give your readers, yourself and our children. Put my name in the hat, please. Thanks for the chance to participate! I have a ten month old and I can’t believe how often I catch myself saying “good job!” even though I know better. It would be great to connect with others trying to parent a little differently :).